What About Sidedress-Nitrogen for Your Corn? Do nothing. A penny not spent on fertilizer means that your expenses will be lower. The down side is that, in some cases, spending a penny would have paid you back five pennies. This is obviously not a good option. Guess. Look at the field and hazard a guess about how much sidedress nitrogen you should apply. Guessing is complicated by the fact that soil that has sufficient levels of nitrogen to raise a good corn crop looks about the same as soils that don’t. The corn at earlier stages of development are often the same color on both situations, especially if starter fertilizer was used. Thus, guessing is not a good idea. Put a little more nitrogen on than you normally would, just for insurance. I call this the “Guess-PLUS Fertilizer Program”. The problem is that you are almost certainly to be very wrong and either over-apply or not apply enough. Either way, this is a very expensive fertilizer program. Listen to the first or the most adamant advice you get. Find someone who is no better at strategies #2 and #3 than you are, and ask them. This can work especially badly if they happen to sell fertilizer or if they have an agenda otherwise different from your own. To be sure, there are probably many fertilizer vendors who do not have ethical lapses when working in a situation where they have an obvious conflict of interest, such as happens when they offer “free” soil testing and also sell fertilizer. Given the world that we live in, I am not going out on a limb to suggest that this type of trust needs to be earned rather than taken for granted. There are certified crop advisors (CCA) who work independently and can be hired to take your samples for you if you do not have the time to do it. Make an informed decision. Pre-sidedress nitrate tests (PSNT) tell you how much nitrate is present in the soil. While it is a snap-shot there is no better way to get a good idea of what the nitrogen status of the soil is and to get a research-based estimate of how much additional nitrogen is needed to achieve your yield goals I will mention that data generated by chlorophyll meters, such as the Minolta SPAD-502, can be used to make nitrogen recommendations, but only under very specific conditions and with a narrowly defined protocol. I would almost rather have someone show up at my farm with an AK-47 than with a chlorophyll meter; it is easier to misuse the chlorophyll meter and more difficult to prove the mischief. Do not use or allow someone else to use one of these devices to make a nitrogen recommendation for your farm unless you know that they have read and are following the protocol found in PSU Extension Agronomy Facts 53: The Early Season Chlorophyll Meter Test for Corn. Many fields in our area are getting past the stage where the PSNT would be useful. The results of your PSNT are only as good as the technique used to collect the sample: garbage in, garbage out. One sample should consist of 15-20 well distributed 12-inch soil cores taken from a field of uniform history, soil type, slope, stage of development, etc. Proper mixing, subsampling, drying, and storage processes are assumed. For those of you who would like to take the PSNT yourself, the basic instructions sample collection can be found in The Pre-Sidedress Nitrate Soil Test (PSNT) For Predicting Nitrogen Needs for Field Corn. More detailed instructions for interpreting the results are included in the text below, taken from page 5 of the publication Nutrient Recommendations for Field Crops in Vermont. Other documents describing the PSNT sampling procedure can be found at the links below. Until recently, there was no reliable soil test for N in the more humid eastern part of the U.S., and N recommendations were based only on yield goals and average soil and weather conditions (See Tables 4 and 5 [see full text]). But with the development of the PSNT by Dr. Fred Magdoff of the University of Vermont, we now have such a tool. 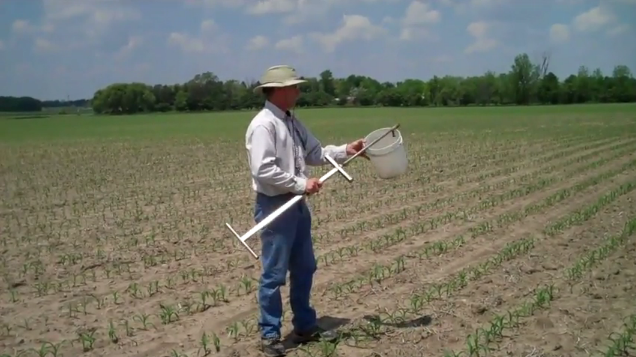 The PSNT requires a soil sample (0 to 12 inch depth) taken when plants are 8 to 12 inches tall. Nitrate measured at that time is a good indicator of the N-supplying capacity of the soil, accounting for soil differences among fields and year-to-year weather differences in the same field. Fertilizer N is then recommended to supply adequate N to the corn crop. Applying fertilizer N at sidedress time is also a more efficient use of N, especially under conditions for high leaching potential, because it avoids loss of N between spring and the start of the period of maximum crop N demand in late June and July. Nitrogen rates based on the PSNT range from a maximum rate at PSNT values of 5 or less to zero at PSNT of greater than 25 ppm (Table 6). Because these are sidedress N application rates they do not include N applied in the starter, assuming a 10 to 20 lb/acre rate. 15 ton/acre yield: N Rate=80-2.5 x (PSNT-5); except if PSNT <5, then N Rate=80 lb/acre. 20 ton/acre yield: N Rate=110-4 x (PSNT-5); except if PSNT <5, then N Rate=110 lb/acre. 25 ton/acre yield: N Rate=140-5.5 x (PSNT-5); except if PSNT <5, then N Rate=140 lb/acre. Soil samples for PSNT are taken between corn rows to avoid starter fertilizer bands so they do not measure starter N. Consequently, starter N rates greater than 20 lb/acre should be subtracted from the recommended sidedress rates. Recommended N rates are reduced by 30 lb/acre where previous crop was a well-managed stand of grass, legume, or mixed forage. Recent research results have shown less yield response to N fertilizer where corn followed a good sod plowdown than the PSNT would indicate. Apparently, this is because N mineralization rate increases proportionally more after PSNT sampling where a perennial forage was plowed down than with a previous crop of corn. 1 Response to What About Sidedress-Nitrogen for Your Corn? Targeting applications makes good economic sense when compared with broadcast application. Sidedressing, on the other hand, improves plant food availability and N uptake and reduces water runoff and associated contamination. 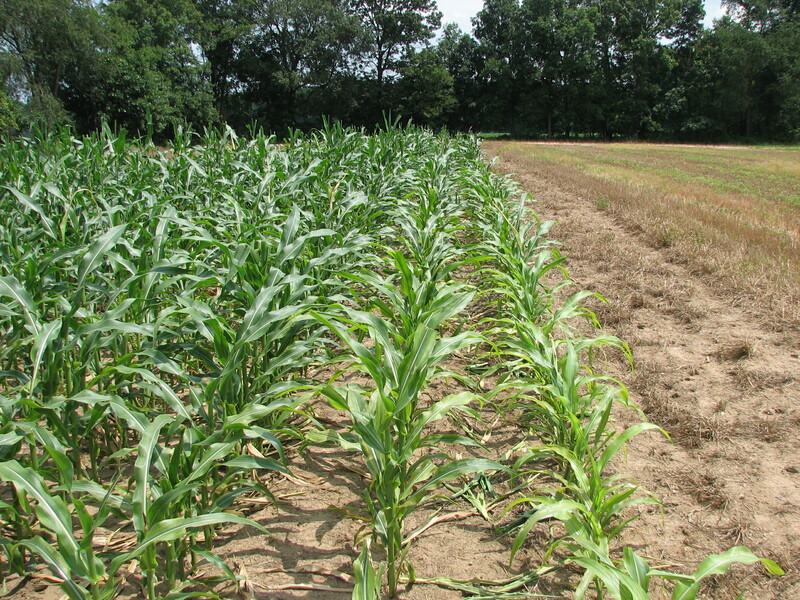 Sideressing can boost yields and profit potential and should be applied by the time by the time corn is 15 inches tall.